In attendance at this event was an assortment of Senators, College Presidents, College Administrative Staff but most importantly college students. 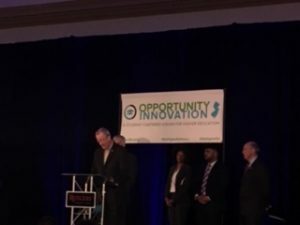 The student speaker was a direct result of the success of the Educational Opportunity Fund (EOF) program, initiated by former Governor Tom Kean. His story outlined his life as a Paterson school system student of a single mother. His vison for his life barely included graduating high school let alone entering college with a double major. With the encouragement of a high school guidance counselor and the EOF program this student is completing one more year of education at Rutgers with a double major, very different from what he had speculated in his future. 2. Retention of NJ high school graduates in selecting in-state colleges. 3. Clear disclosure of college students employment rates based on major after graduation. 4. Safer learning and campus environments, no inclusion. 6. Supportive faculty and staff including better student resources. 65 by 25-currently the state of NJ retains about 45% of high school graduates to NJ based post-secondary institutions. The goal of OSHE is to increase that number to 65% by the year 2025. As Governor Murphy put it “college students will not be New Jersey’s number one export”. 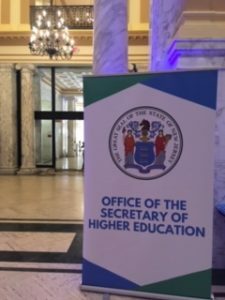 The future of post-secondary education in the state of NJ seems bright and in full support of the student-centered vision for the state of New Jersey’s Higher Education.